This upcoming handset features a rotating image snapper like the Oppo N1, but it will also be slimmer and the camera module will be located on a bulge on top. One week after Oppo posted on Facebook a teaser that did not reveal anything (a picture of an old rotary dial phone saying "This was the phone. Time to turn things around in October"), an anonymous tipster sent GSMArena.com images of the alleged next-gen N series handset, Oppo N3. Unfortunately, the tipster did not reveal anything about the specs and features of the handset, but the images are surely enough to raise the brand awareness even more. The Oppo N1 has hit the market back in October 2013 loaded with Android 4.2 Jelly Bean and features a Qualcomm Snapdragon 600 SoC, 5.9-inch Full HD display, 2 GB of memory, 16 GB or 32 GB of internal storage, 13 MP rotating camera with autofocus and dual LED flash. The Oppo N3 seems to be much thinner than the N1 and its camera is located in a bulge on top, where they apparently included the speaker as well. 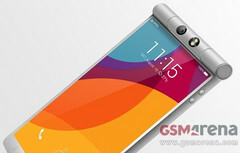 The handset will also feature dual LED flash as it can be clearly seen in the images. Remains to see how long will it take for them to bring this on the market and how will it compare with large screen flagships like the Galaxy Note 4 or iPhone 6 Plus.